Costs – Tree owners in Wilmington, Delaware should know what their neighbors pay for tree removal, maintenance and stump removal as they get quotes from arborists. Find it here. FAQs – Wilmington residents looking to plant new trees have a wide variety of species to choose from, but you should know which ones to avoid and the rules when it comes to city regulations regarding trees. Services – Hire an arborist today to ensure healthy trees for a long time. How Much Do Tree Services Cost in Wilmington? Despite being the largest city and urban area in the state of Delaware, Wilmington is a lush and green destination with a number of trees to provide shade, clean air and aesthetic appeal. This guide can help homeowners or property owners in the area better maintain their existing trees in Wilmington area landscaping. Removing a tree requires much more labor and equipment than removing a stump and will cost around $860. Whether it is being removed because it is too close to overhead power lines, a home or simply other trees, it has to be tethered and felled so that it comes down safely and away from anything important. This process will cost more if the tree is a safety risk or extremely tall, which tends to be anything over 40 feet in height. While stumps may not pose the same risks as dead or dying trees, they can still be a safety concern and an unsightly addition to the property. Thankfully, professionals can handle this problem easily for between $85 and $150. They bring in large grinders that eat away at the stump from the outside working inwards. The process takes just minutes, and tends to cost less than $150 in Wilmington. Thanks to steady precipitation throughout the year, trees in Wilmington generally require regular trimming and pruning on an annual basis. Tree owners should expect to pay about $360 per tree. Trimming should be done in the spring or early summer, and pruning for fruit-bearing trees should happen in the winter before the spring shoots begin to emerge from the branches. With a location between the Christina River and the Delaware River, as well as a humid subtropical climate, Wilmington is the perfect place for a variety of trees to grow and thrive. From fruit trees to evergreens, trees make up a significant portion of the city’s landscape. Let this serve as your guide to planting trees, following local regulations and picking the best tree choices for any property. In order to keep the tree canopy in Wilmington full and beautiful, the city has an official Tree Commission that meets regularly to protect area trees and plant more as necessary. However, property owners are free to remove any trees on their land as desired. The exception to this rule is when the trunk of a tree is partially or wholly on public land, which then requires a permit. A tree permit is also required by anyone who wants to prune street trees, even if the branches are problematic for an individual’s home. The best time of year to remove trees on individual property is in late autumn, ideally before the first freeze of the year that hardens the ground and makes removal more challenging. One of the largest energy providers to the Wilmington area is Delmarva, which has a few recommendations concerning trees and overhead power lines. They remind homeowners not to trim tree branches close to overhead power lines but instead to contact their maintenance crew as quickly as possible. In addition, Delmarva has a responsible planting program encouraging property owners in the area to plant appropriately short trees within 20 feet of any existing overhead power lines to avoid problems in the future. Officially called the Ilex opaca, American holly is the state tree of Delaware. 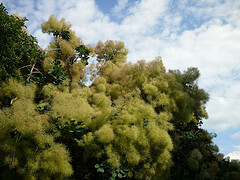 It was chosen because it grows in large amounts throughout the state. American holly is a evergreen tree that typically matures around 30 feet in height and boasts pointed shiny leaves, red drupes and beautiful white blooms during the summer. American holly can be seen throughout Wilmington and the surrounding areas as well as all along the Eastern Coast of the United States. In order to spot the tallest tree in the city of Wilmington, head to Winterthur Gardens. This public space is home to a yellow poplar that is 187 feet tall. Shorter trees are also common, and many of the shortest include dwarf fruit trees found in residential backyard gardens. While Delaware does experience freezing winter weather, it is still a hospitable climate for a number of fruit trees. Just a few of the varietals that grow most successfully in this part of Delaware include apples, peaches, apricots, nectarines, pears and plums. Delaware may boast a variety of attractive trees, but it is also home to some less than desirable pests, diseases and insects that can harm or kill even the largest trees. Some of the most common problems affecting trees in Wilmington include boxelder bug, Asian longhorned beetle, emerald ash borer, sudden oak death and bacterial leaf scorch. 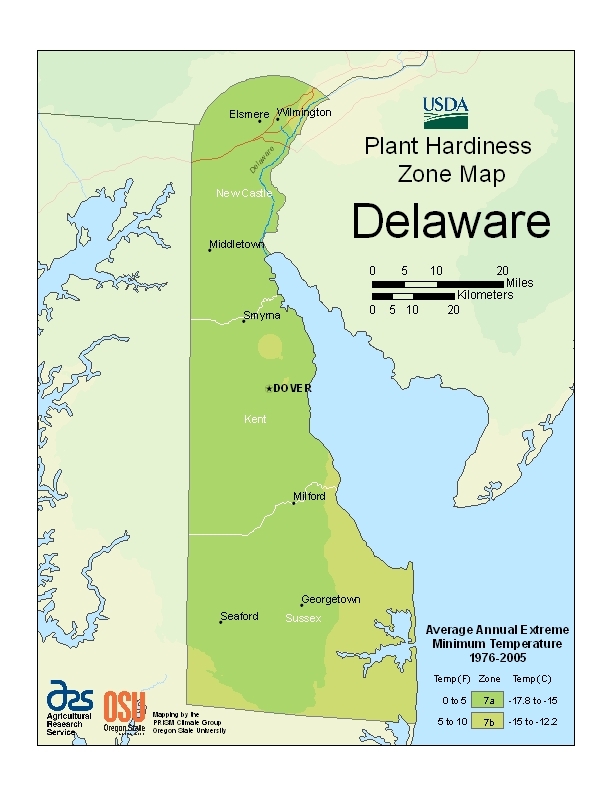 One of the best ways to pick trees that will grow successfully in Wilmington’s climate is to take a close look at the USDA Hardiness Zone Map. According to that, Wilmington is located in a 7a zone, which translates to potential temperatures as low as 5 degrees Fahrenheit. With that information, property owners can seek out trees with similar rankings. Look for trees that are rated for zones 6, 7 and 8 for the best results in this part of Delaware.